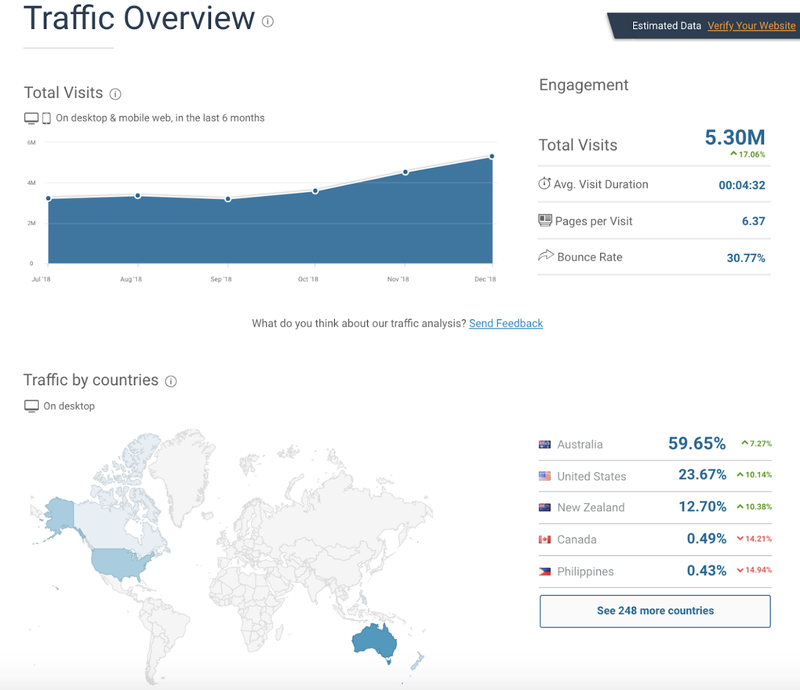 We’ve been tracking Afterpay’s US roll-out by following inbound traffic on sites like SimilarWeb, which helped us ride out the recent volatility. SimilarWeb showed months ago that Urban Outfitters, a US store, was the number one source of inbound traffic, ahead of any Australian website. This was quite an achievement, given the firm had only been operating there for a few months, and an important indicator of early momentum. 10% of online retail in Australia is now processed by Afterpay, and the opportunity in the US and UK is orders of magnitude greater. If the firm achieves similar success in the US, Afterpay could be valued in line with payments peers like Stripe (~$20 billion) or even PayPal (~$105 billion). The real surprise for us was Afterpay’s success in-store, which now accounts for over 15% of sales. Afterpay posted a strong increase in US inbound traffic in December 2018. In our opinion, Afterpay is the single best way to buy something on the internet. The value proposition for the customer is clear: free credit, and a seamless username and password purchasing experience. This is far easier than typing in credit card details and a lot less cumbersome than Paypal. The value proposition for merchants is also straightforward: an immediate and easily measured increase in sales. Regulation is a risk, but as the Australian real estate market reels in the aftermath of considerable political attention, policy makers are hopefully sensitive to the unwelcome side effects of restricting lending. Putting burdensome regulation on one of the few drivers of retail demand would not be wise, in our opinion, nor welcome. Afterpay’s approach to credit risk is far more democratic than arbitrary tests of income and spending. The firm allows most to borrow small amounts, then quickly cuts off those who default, while allowing larger purchases to those who prove reliable. This is precisely how lending should work. And every month of progress in the United States reduces the impact of an Australian regulatory setback. Everyone seems to want to invest in data these days and Afterpay’s is particularly valuable: they know which of their 3.1 million customers will repay a small, short term loan, and which will not. With every passing week, Afterpay weeds out more defaulting customers, leaving them with an increasingly responsible and profitable user base. Afterpay has a surprisingly good lending business: the loans are small (~$150), short term, quickly amortised, free for consumers and can’t compound into significant amounts. These are characteristics of good credit risk, in stark contrast to credit cards and personal loans, which are expensive, enforced, and for those unable to keep up with payments, can quickly accrue into ruinous long-term liabilities. In return for taking fairly benign credit risk, Afterpay earns ~4% from merchants. This doesn’t sound like much, but annualises to a far higher rate than personal loans or credit risks, all for a superior risk profile. The firm has clearly hit a resonant chord amongst consumers. Competitors lack Afterpay’s simplicity, and mostly give consumers a traditional line of credit couched in the language of fintech. Zip, frequently cited as a competitor, offers a wallet with a spending limit. Affirm in the US offers comparatively high value loans with interest. Klarna similarly, offers loans and charges interest. None of Afterpay’s competitors have shown the discipline of Afterpay’s management to focus on one, easily described (in a single word!) credit product. Contrary to the commentary of some local value investors, it’s very possible to form an analytical valuation of the stock. By forecasting their future customer base, average transaction value and transaction frequency per year, it’s possible to model revenue under different scenarios. By applying their net transaction margin (which can be flexed by financing costs, operating costs, defaults etc) you can come up with a profit figure and form a valuation. As you might expect, much depends on their growth runway in the United States, which is why we consider their early momentum and traction so relevant. It’s often hard to say why one product succeeds while a similar one fails, but in this case it’s clear that Afterpay has that magic pixie dust that makes it popular with consumers and indispensable to merchants. Perhaps it’s the simplicity and discipline of the product, the zero interest model, or even just the name, but there’s growing evidence from the US that shows this not a solely Australian phenomenon. If so, the firm’s best years are still ahead of it.